Why stand on the sidelines? The kitchen of the future is both light and dark, cosy and open. A truly individual piece of design complete with handleless front panels to create a refined look. The furniture is unobtrusive and creates plenty of storage space, featuring shelving units that complement wall units and tall cabinets alike. The intelligent interior layout is ideal for use in a range of environments – including other living areas. Wood and metal join forces in a combination of materials that is rounded out with concrete, raw stone, textiles and glass – including in the form of unique pieces where possible. And then, of course, there are copper, brass and steel elements to add a sense of contemporary industrial flair to the mix. What’s more, manufacturers are now trying out state-of-the-art smart-home concepts within the kitchen. All of this and more was on offer at this year’s Küchenmeile event at the heart of the kitchen furniture industry, which took place in East-Westphalia from 15–21 September 2018. And enjoying centre stage at the fair were the products from Kesseböhmer. Area30, House4Kitchen, Kitchen Center Löhne, Gut Böckel, Cube30 and the countless other home exhibitions made it clear that storage solutions and interior fittings are all the rage right now. But the number-one priority has to be customisation. 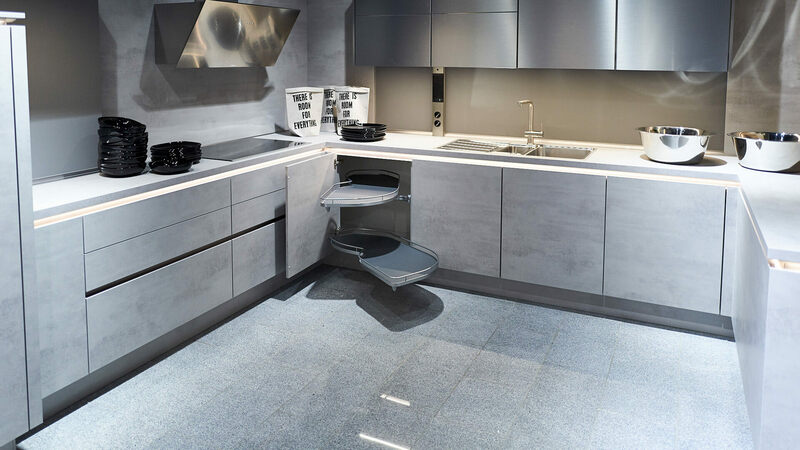 In a world where the kitchen is no longer a mere workspace, but a real showcase opportunity that is perfectly adapted to suit its users’ needs, the company that can offer the greatest modularity will always win out. This is highlighted in particular by the various shelving systems now in use. Their directly accessible and presentable storage space has seen them grow in popularity. Not only that, but they also open up the kitchen as a real living area. With the latest trend for dark surfaces, their contemporary grey or black finish (matt black being a particular favourite) coupled with indirect LED light is a match made in heaven. The combination featuring wood – primarily oak – is the most common choice in all variations. 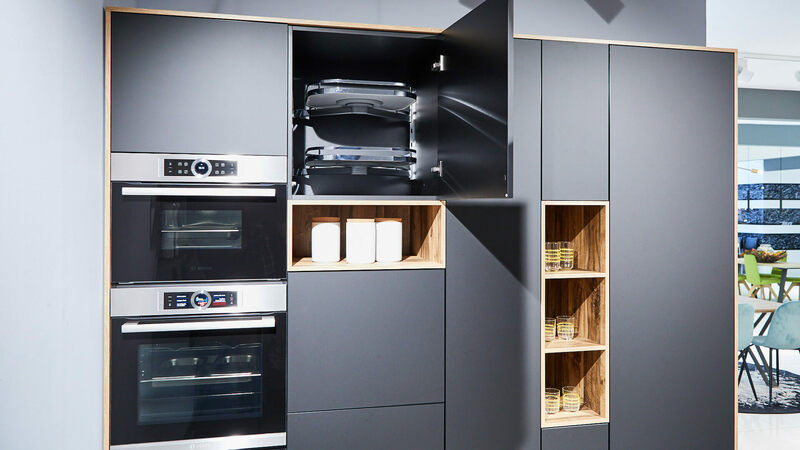 It was particularly striking this year to see the number of handleless front panels on offer, with each kitchen manufacturer adding their own special twist. Some feature concealed profile handles that resemble little more than slender lines, sometimes the front panels really are handleless in the truest sense of the word. The push-to-open technology on which these are based has now become the go-to opening and closing method for contemporary drawers and pull-out systems for a hands-free experience – at least for base units. 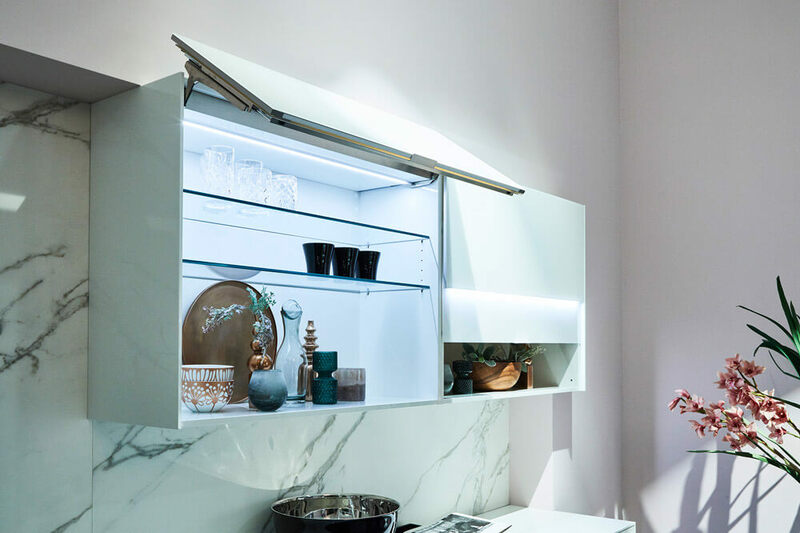 Kitchen manufacturers are not only demonstrating their creativity in the multifunctional use of existing fittings systems in the kitchen, but also transferring this functionality to other living areas. As a result, industrial-style shelving units are seen as more than just a partition between the living/dining room and kitchen, they can also be found between bedrooms and dressing rooms, in the bathroom, or even as coat racks in the hall. Pull-out larders even come in handy in the office, bathroom and utility room, opening up the full potential of these contemporary, ever-evolving, classic storage solutions. Interior systems for drawers and pull-outs with a sophisticated wood finish also look great in the bathroom as they radiate warmth and keep contents organised. The ability to maintain order and organisation is a perennial issue not only for open storage spaces, but also behind front panels. Depending on the cabinet in use, the contents are always kept organised by trays with a high load capacity, convenient rotatable access, and the ability to be pulled out to the front. Their anthracite finish reflects the trend towards darker surfaces perfectly. In the kitchen, pull-out larders are classic dry food storage units. A kitchen cupboard featuring this design makes maximum use of the available storage space without being obtrusive. It offers a clear overview of all of the storage items from two or even three sides, as well as convenient access to all stored food items and utensils since the contents can be pulled right to the front once opened. 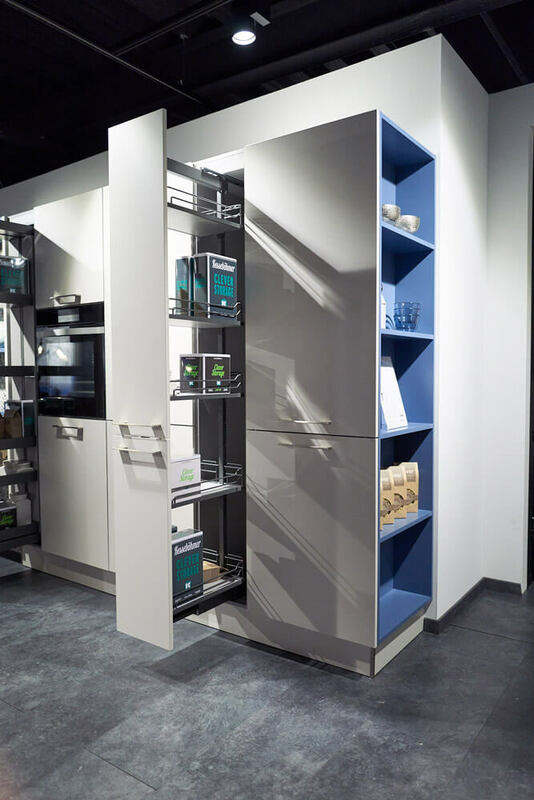 Rödinghausen-based Störmer Küchen uses the Kesseböhmer ‘Dispensa’ to enable kitchen users to experience tried-and-tested storage techniques straight from the pharmacy. 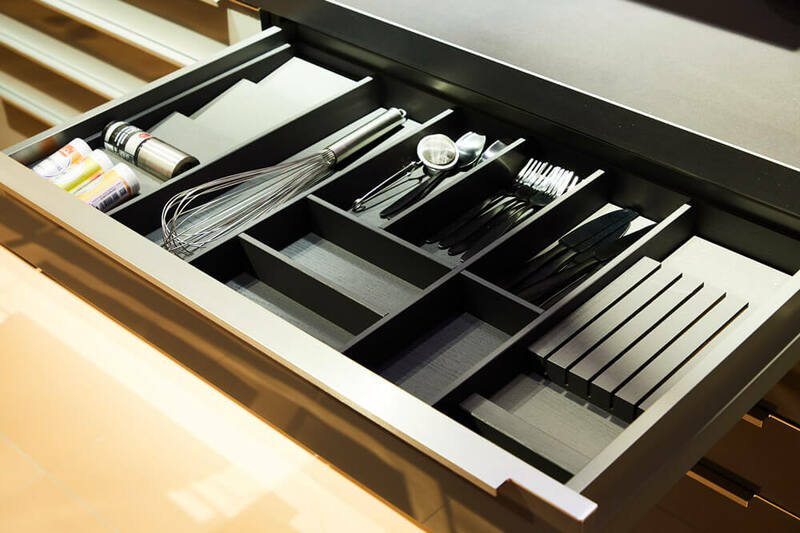 Interior systems for drawers and pull-outs with a sophisticated wood finish radiate warmth and keep contents organised. Dark wood tones carry the trend from the outdoors in. First slide, then fold: together with the integration of various light sources, the ‘SlightLift’ has created a whole new style of wall unit – a combination of cabinet and shelving unit complete with special functions and emotive appeal. The unit was developed as a joint venture between Häcker and Kesseböhmer, and was also on display at Küchenmeile 2018.